Catch Me Daddysees Sameena Jabeen Ahmed’s Laila on the run, pursued by her brother and a gang of bounty hunters who have been given the job of bringing her back home. Understandably, a lot of attention has been drawn to the Western-sounding premise, but there’s a whole lot more to the film than that and, in a way, the narrative is the least interesting aspect of this impressive British indie movie. It is often said that eyes are the window to the soul and, whatever you think of the surrounding movie, Daniel Wolfe’s debut feature will leave you believing just that. Led by Ahmed’s quietly effective performance, we follow the unfolding drama via her eyes; from their natural strangely mesmeric misty green, to a sleepy haze, to bloodshot and terrified. And all this from a first-time actor . . . The great eye-work doesn’t stop there. Gary Lewis’ baby blues hide an intense pain tragically, and belie any assumptions of his muscle-for-hire cocaine addict character. This extends to some powerful images of birds of prey staring down the lens, as if the camera’s a lowly mouse caught in it’s stupefying stare. This moment – and Wolfe’s eye for arresting imagery, as a whole – really shines and harks back to his background directing music videos. He draws so much meaning from the silences (see the dialogue-free teaser trailer) and one glorious dance sequence mid-way through would make a terrific music video in it’s own right. But, with that being the high point, we get the feeling that Wolfe feels most at home in the short-form image-heavy music videos in which he made his name. Wolfe made the now-rare choice to shoot on 35mm film (as opposed to digital), and the results are gorgeous. Robbie Ryan’s cinematography is truly exceptional and he draws a real beauty out of the moonlit moors and city lights. His exquisite framing also accentuates the cast’s set of fascinating, but rarely stereotypically attractive, faces. In the same way, Wolfe’s very much at ease with the film’s British-ness. The locales and the accents ring true and he is refreshingly unobtrusive when it comes to the temptation to tamper and sanitise. It’s a film totally unashamed of its lack of glamour, and that’s something to be admired. The work from composers Daniel Thomas Freeman and Matthew Wolfe (as Matthew Watson) also veers away from any genre, or even cinematic, traditions and instead focuses on the use of ambient sounds to create a jarring soundscape. One particular gunshot reverberates through the theatre and the score mirrors the shocking bursts of violence perfectly. However, the impact of the violence does deteriorate as the film nears its somewhat weak conclusion. Wolfe shares a writing credit with his brother, Matthew, and their plotting loses its potency in later scenes. An avoidance of consequence towards the finale sits uncomfortably against the naturalism of so much of the film. Without wanting to spoil anything, the death and destruction seems a tad too much, as does Ahmed’s descent into child-like wailing. Wolfe and Ahmed are certainly ones to watch, despite some missteps from the both of them in the final act. 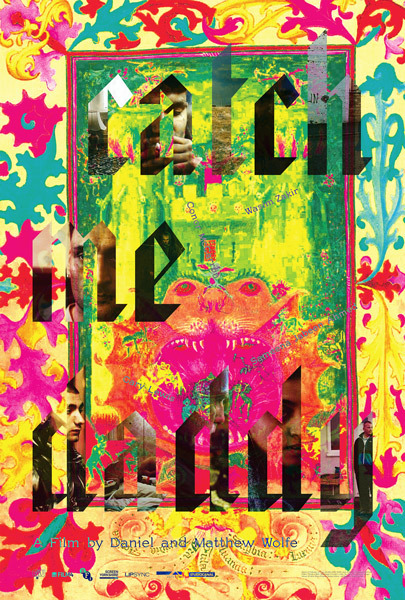 But it would be a downright lie to say Catch Me Daddy isn’t a highly-charged, and often immensely powerful, debut from a very talented creative team, dominated by some terrific visuals and a set of quietly effective performances. This review was originally written for Close-Up Film.